1. The Downtown Rochester Festival of Trees kicks off on November 16 with a cocktail preview. This beautiful event features trees, wreaths, stockings, tablescapes, centerpieces and Gingerbread Houses designed and donated by the Metro Detroit community. The event will be open to the public on Saturday, November 17 from 10 a.m. – 9 p.m. and Sunday, November 18 from 10 a.m. – 5 p.m. Proceeds benefit The Big, Bright Light Show. 2. The Big, Bright Light Show begins Nov 19 during Lagniappe and continues every night from 5-midnight through January 6, 2019. The city will also be lit on weekends in January for the Fire and Ice Festival. 3. 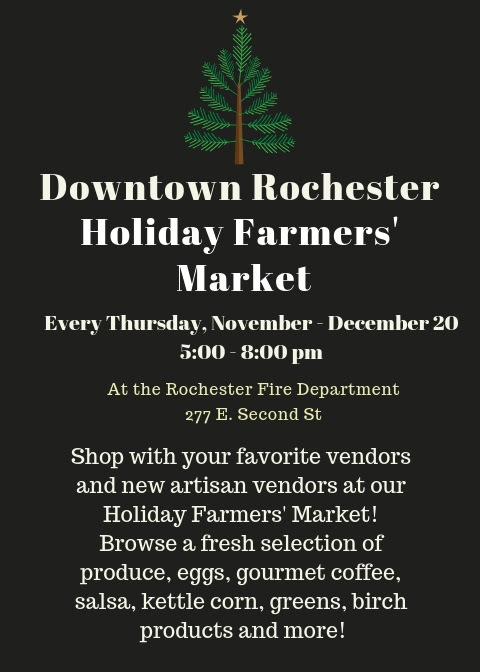 Holiday Farmers' Market: Come to the Downtown Rochester Fire Department every Thursday evening through December 20 for a special holiday farmers' market! Fresh produce, eggs, and lots of other goodies. 4. Small Business Saturday: You know the drill - shop small! 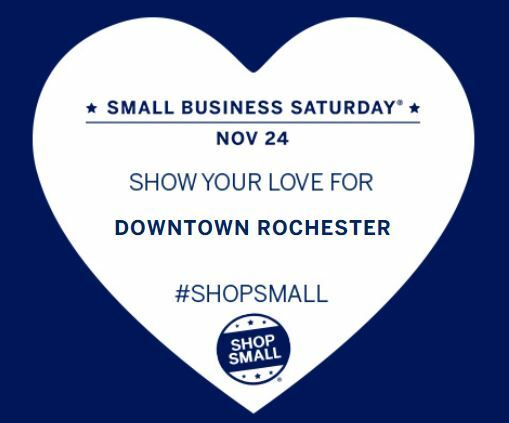 Support our local Downtown business on Saturday, November 24, and all holiday season long. Enjoy complimentary carriage rides from 11 a.m. - 2 p.m. @ E. Fourth & Main. 5 and 6. The Kris Kringle Market will take place on Friday, November 30 - December 1 on West Fourth Street. The street will be closed at 7 a.m. on Thursday, November 29, and will be reopened at the end of the Rochester Hometown Christmas Parade, which takes place on Sunday, December 2. 7. Caroling in the City: Sunday, December 16 from 5 -8 p.m. The city is closing the road from Second Street to University, and the event will take place on Main Street. Caroling in the City will include choirs, caroling, contests, Christmas activities, and much more. Business are being encouraged to stay open that evening to accommodate the large crowds. Take some time this holiday season, and join your community in the most wonderful time of the year! Well, folks, it is my favorite time of the year! I have a few suggestions on some scary places to visit in the Metro-Detroit area this October! If you didn't grow up in Michigan, or if you come into contact with people who are not from Michigan, you have probably been asked this question! Summer is quietly winding down. The stores are bringing out decorations covered in pumpkins and leaves letting us know that Sweater Weather and Pumpkin Spice Latte season is right around the corner.